It's been a week now since the 2012 Summer Olympics hosted by the city of London concluded. Americans have been rejoicing ever since as we topped not only the overall medal count, beating China by 16, but also finishing atop the standings in the number of gold medals won with 46, eight more than 2nd place China. As usual, contests that seemed to be a forgone conclusion on paper turned out totally different. That drama, along with the great human interest stories, is what makes the Olympics so compelling Let me go over the things I thought would be big stories, then recognize some things that became big stories, and then look ahead to Rio 2016 when we'll put on our Uncle Sam hats and do it again. RYAN LOCHTE - In a pre-Phelps swimming world, what Lochte did in 2012 would have been revered. But just like NBA players who don't have rings because they played in the Jordan era, Lochte will always be measured against his homey. Two gold, two silver, and a bronze is a nice haul for any Olympic swimmer, but when you consider that he won five gold at the 2011 World Championships, and that he lost his signature event (200bk) and got run down on the anchor leg of a relay, you'd have to say that he didn't quite deliver in London. No worries, he's still going to get his money, and he'll likely be back for more medals in 2016. USAIN BOLT - Delivered like a champ. Erased all memory of him getting beat in the Jamaican trials by Johan Blake, and got the gold trifecta (100m, 200m, 4x100relay). Got no problem with him saying he's a legend, but he's not the greatest athlete to live. For my money, he'd have to hurdle and long jump to begin to make that claim. 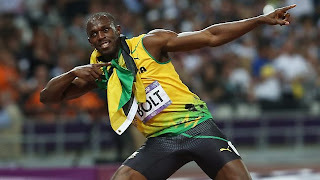 Speaking of long jumping, shame on Carl Lewis for trying to rush the stage Kanye-style during Bolt's moment. Nobody has forgotten Los Angeles in '84 Mr. Lewis, relax. JORDAN WIEBER - The regining All-around World Champion gymnast didn't even make it to the all-around Finals in London, though she arguably deserved to. Then when she got a chance to earn a medal in an individual event, she got seventh. 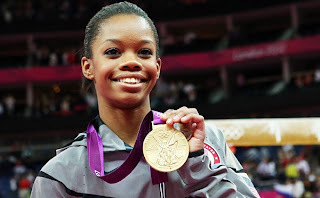 To spin this positively, it is a testament to the development of US Gymnastics that the reigning World Champ could be outshined by two teammates, and be reduced to a supporting role. SANYA RICHARDS-ROSS - You could not miss Richards-Ross face in pre-Olympicpromotional campaigns from Shell, Citibank, and Nike. She delivered in this Olympics unlike in Beijing '08 by winning her signature event, the 400m. GABBY DOUGLAS - In a story made for Hollywood, the 16yr old becomes the first Black woman to win the Olympic all-around. It was tough watching her fall off the beam and struggle in her individual events, but her Olympic performance will go down in history. YE SHIWEN - The Chinese 16yr old took gold medals in the both the 200 and 400 individual medley, and raised eyebrows for her blazing freestyle split in the 400. DAVID RUDISHA - Performance of the Games as far as I'm concerned winning the 800m on the track with a world record time of 1:40.91. The way he ran the race, effortlessly separating at the 450 mark, had to leave not only the track fan, but the layman saying "How did he do that!" Hope they find a nice spot for his tree at St. Patrick's. Knight, Williams, and Thompson are the only ones not already in the USA Basketball pipeline. The other 9 were members of the 2012 Select Team which served as a sparring partner for the Olympic team. I could not see this team not winning the Gold medal because there's no proven player like LeBron, Kobe, Kevin Durant, or Chris Paul who could put the team on their back in the 4th quarter, but it would be interesting to see who might emerge. REINVESTMENT INTO USA TRACK&FIELD - I've never seen such a poor showing on the men's side in Track & Field. Bronze in the 100m, NO medals in the 200m and 400m (first time since FOREVER), and Silver in the 4x100 and 4x400. In contrast, it was a banner Olympics for the T&F field women. Silver in the 100m, Gold and Bronze in the 200m, Gold and Bronze in the 400m, Gold in the 4x100m and 4x400m relays. What is apparent is that there is very little support for the National team unless you have past medal pedigree, which means we're left with college athletes, who are overextended by the time the Games take place, and a large number of pros who cannot fully dedicate themselves to training because they have to work at Home Depot or Staples to support themselves (hence why Dawn Harper and Kellie Williams have been unloading darts on Lolo Jones). I wonder if USATF will figure it out like other USA governing bodies have. WILL NFL FOOTBALL GO OLYMPIC - If I had not heard Roger Goodell talk about it with my own ears, I wouldn't believe this to be an actual movement. Can't ever see this happening, but it will be interesting to see if it's still being talked about four years from now. I'm feeling really blessed like Jill Scott today as I have reached Year 10 of my marriage to the former Nkechi N. Okoro. Ten years means alot to me, and I see it as a milestone because it is half as long as my parents were married. It makes me reflective about what has worked so far and what I need to continue working on. I'm only riding the marriage coaster once, so I plan to do everything I possibly can to maximize the experience. At ten years, with two kids, and living in a house with an actual picket fence, I feel like we have achieved many of the goals that couples set for themselves when they come off the euphoria of the wedding and honeymoon. The Mrs. and I are now into what I call the Foundation Years where we are building our family and looking to cement our brand so that we are maximizing the return on our labor. When we reach the empty nest Legacy Years post-retirement, we'll have solace in knowing that we have left something for the next generation of Carrolls. In arriving at this point, I feel like the eighth grader who has graduated and is now about to start high school. I'm more concerned with how I can learn from the upperclassmen, then what I can tell a sixth grader about surviving middle school. - Discipline is necessary to make sure that when I plan to do something, I execute the plan. My disposable time is not as abundant as it used to be, so in order to achieve my goals and maintain the life balance I want, work time has to be just that so that I can play when the opportunity arises. - Patience allows me to be a better father because it enables me to take the time to teach my sons the lessons they need to learn. It helps me be a better husband because I don't take it personal when I can't have as much of the Mrs. undivided attention as I once got. Patience keeps me from being selfish. The minute you start to feel like you're entitled to be selfish in a marriage, the foundation starts to crumble. The beauty of marriage is that it's the partnership that allows you to see the things about yourself that you want to improve because the growth is for the good of the union. The self-work that I do allows me to be a better captain of the ship, and the better I captain the ship, the less chance there is for a Titanic vs. Iceberg moment, or in my case, the Mrs. running off with 50 Cent, or some other Hollywood leading man. One of the things I'm most excited about for this anniversary weekend is the chance to celebrate with many key members of our support network and express to them how much they have meant to us. Marriage peers and mentors are instrumental in making it last, and we have a number of role models who have taken us under their wing, and have given us a roadmap of what the road looks like ahead. At the same time, our peers have been able to share in the successes and prop us up in the seasons of struggle. While ten years is good, there is much more marriage ahead that I'm looking forward to. There is not a day that I don't think I've got the best partner I possibly could have riding shotgun with me. Love you Nkechi.